From his post at Humboldt State University, Arne Jacobson passionately extends his PhD research addressing the real-world barriers to providing clean energy for poor people in developing countries. In so doing, he plays a critical role in the deployment of millions of solar systems across Africa and Asia. A physics major in college, Arne spent his junior year abroad in Bogotá, Colombia, encountering cultural differences and poverty on a scale he had never before experienced. That transformational year set him on a broader social justice and environmental trajectory. After college, Arne spent two years gaining hands-on experience installing solar water and electric systems in urban and rural communities in New Mexico and then the Bay Area. Upon entering HSU for a Masters in Environmental Systems, he was hired as one of the first two graduate students to work at the then-recently established Schatz Energy Research Center (SERC) – which he now directs. Staying on for another three years after graduating, he began doing international work in Himalayan India, where he began to focus on the challenge of how to scale-up renewable energy technology to serve the energy impoverished. Very quickly, he realized that engineering is only a third of the story – that policy and social science skills are necessary to scale-up effectively. ERG was the perfect next step. There, Arne focused on energy policy and social-political geography with Michael Watts and Gillian Hart, both ERG affiliates (now emeritus) in Berkeley’s Geography Department, with ERG’s Dan Kammen serving as his dissertation committee chair. 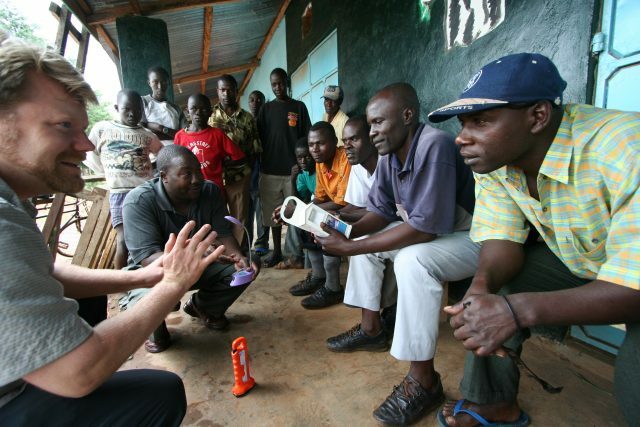 His dissertation sought to understand why Kenya hosted the largest solar market per capita on the African Continent. To explore that, he acquired socioeconomic and development perspectives. Many classes and much research later, he found reasons that were surprising: the desire for social connection, through TV, radio and, later, mobile devices, rather than lighting, was the major demand-driver for solar. Second, a high ratio of teachers per capita in Kenya created a rural professional class that desired connectivity – one-third of solar systems were owned by households with teachers. As leaders in the community, the teachers’ example spurred further demand. In addition, Kenya had stronger markets than other African countries, enabling solar systems to be channeled through existing supply networks. Arne credits this broader outlook for his role in developing a major international quality assurance program, for which SERC now serves as technical lead. While working on his PhD, he found that the fear of being cheated and the inability to make informed choices was suppressing interest in solar energy systems. In a country with a weak regulatory infrastructure, Arne recognized the need for a consumer protection institution. With backing from World Bank and the International Finance Corporation, Arne helped to develop Lighting Global, which has certified some 20 million solar systems sold for use in off-grid areas in African and Asian countries. The program has helped build market share for businesses that sell quality products and advertise truthfully. “Understanding the social dynamics around the adoption of solar technology is as important as the technology itself,” Arne says. Arne is fostering ERG’s interdisciplinary style at HSU. Though his professorship is in Environmental Resources Engineering, his department has become comfortable with interdisciplinary approaches. This enabled Arne to build HSU’s Energy Technology and Policy (ETaP) Master’s Program with support from 10 faculty from three colleges across campus. Under Arne’s direction since 2012, SERC likewise embraces interdisciplinarity. His success is evidenced by the number of students he has sent on to ERG for their PhDs.